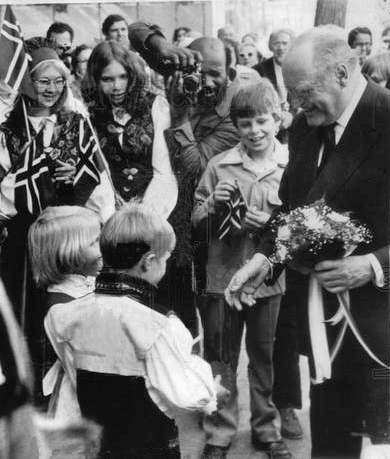 October 16, 1975 – King Olav V of Norway, in town for the observances of the 150th’ anniversary of the start of Norwegian immigration to the United States, receives a gift from Mayor Richard J. Daley – a facsimile of the 1922 Montgomery Ward and Company catalogue. A spokesman for Ward’s says that Daley had first seen the catalogue, a replica of the original and created by Ward’s as a nostalgia item, during the dedication of a store at the Ford City Shopping Center, an appearance that caused His Honor to arrive 15 minutes late to his meeting with the King, and “decided it would make a nice gift for King Olav and took one along.” [Chicago Tribune, October 17, 1975] Says Daley, “I told him he should order from it because Montgomery Ward is a great place to do business, and we all know what the catalog meant to the early settlers who came to Chicago.” According to the Tribune, “Olav made no comment.” During his stay the 72-year-old King tours the Art Institute of Chicago, where on May 4,1939 he was the first person to sign the guest book for visiting dignitaries. He is also feted at a University of Chicago luncheon, held to inaugurate a university chair in Norwegian studies. The above photo shows King Olav V in front of the Norwegian Memorial Lutheran Church at 2614 Kedzie Boulevard where he stopped to hear a Children's Choir during his stay. 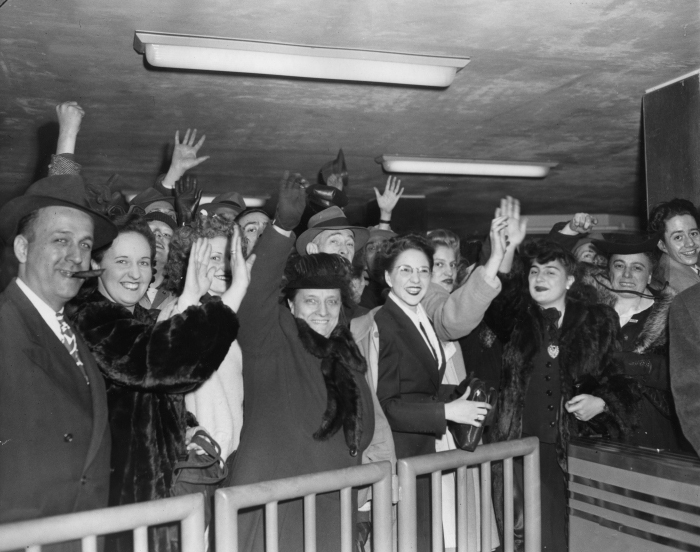 October 16, 1943 – At 10:48 a. m. a ribbon is cut at State and Madison and Chicago’s first subway, first proposed in the Chicago Plan of 1909, opens for business. The ceremony begins with a parade that takes an hour to pass the reviewing stand on State Street. As Mayor Kelly gets ready to cut the ribbon, Subway Commissioner Philip Harrington, says, “I am proud to inform you and the people of Chicago on behalf of the engineering staff of the department of subways and its contractors, that Chicago’s first subway is complete, ready for operation. I can assure you of the thoroness [sic] and durability of this structure and the safety of its equipment. This subway compares more than favorably with any of the other undergrounds in the country.” [Chicago Daily Tribune, October 17, 1943] This first phase of the city’s comprehensive subway system starts at Armitage and Clybourn Avenues on the north and extends to a point between Sixteenth and Seventeenth Streets under State Street.